We’ve had a fantastic start to 2019, celebrating our tenth anniversary of the Jerwood DanceHouse with inspiring premieres, events that allow us to indulge in dance and events that will make a difference to the dance sector. We are continuing on a high with our Summer Season and I’m particularly looking forward to our Double Bills – having followed the same formula for a while, we’re looking forward to trying something a little different and would love to know what you think. We have two evenings of Double Bills (see pages 3 and 7), both promise to be of high quality, presenting new work and work from international artists – these are nights you’ll want to bring your friends along to. Throughout 2019, we are highlighting 10 events that represent the spectrum of our work, one of these is House to Home. We are incredibly proud of the work we do within our community and the positive impact we have on those around us. This performance will include over 100 community dancers, inspired by how the Jerwood DanceHouse has and will be a home to so many. I hope you’re able to join us in celebrating such an important part of who we are. It might be the anniversary of our purpose-built home, but DanceEast has existed for more than 35 years to bring great dance to the East of England and working across the region remains a priority for us. This summer you’ll find us in Lowestoft on more than one occasion! From local community members dancing in the park, to First Light Festival where there’ll be dancing on the beach for 24-hours, we are determined to introduce dance to as many people as possible. An evening of new dance and dance theatre reflecting the possibilities of contemporary dance today. The evening will be opened by DanceEast Junior Associate Artist, Kaia Goodenough. Kaia is both DanceEast Centre for Advanced Training (CAT) and INTOTO DANCE alumni. Kaia will be sharing an extract of her new choreography and discussing her journey from the DanceEast CAT, to studying at London Studio Centre, and becoming an Associate Artist at DanceEast. Following Kaia's work INTOTO DANCE will present the daring physicality of Nathan Johnston, along with the gutsy and visceral style of Victoria Fox Markiewicz (TRIBE//) and the emotionally charged work of INTOTO DANCE alumni, Luke Brown (Luke Brown Dance). For over 27 years, INTOTO DANCE has supported emerging choreographers, as well as commissioning work from established figures in the world of contemporary dance and dance theatre. LOVELY GIRLS Friday 24 May The Hiccup Project 7.00pm Alleyne Dance 8.30pm Come along to just one performance or for the whole evening! This season we have two Double Bills - a new format for DanceEast that we’re looking forward to sharing with you. The evenings will present new work from a total of four different artists, two on each night. These very different artists are all at the start of their careers and we want you to experience them at this exciting early stage. The first of these Double Bills is from The Hiccup Project and Alleyne Dance. The Hiccup Project duo are often found in the studios at DanceEast rehearsing, leading workshops and amusing the DanceEast staff. They’ll be presenting their new work, Lovely Girls and we promise you’ll be in for an evening of thought-provoking laughter. We also welcome Alleyne Dance to DanceEast for the first time and what better way than as part of this powerful Double Bill? We hope you can join us for this celebration of female choreographers and performers. Our second Double Bill can be found on pages 7 and 8. The Hiccup Project is supported by Arts Council England, South East Dance, DanceEast and The Place. A Night’s Game is supported by Arts Council England, Arts & Movements Ltd., Desti Masti Studios, Akram Khan, The Brit School of Performing Arts andl Ultima Vez Company. Comedic dance-theatre company duo The Hiccup Project, are often introduced as ‘The Lovely Hiccup Girls’. This got them thinking. A Night’s Game reflects the turmoil and strife of human emotion when faced with the prospect of incarceration. Explore the mind's journey as the loss of freedom engulfs every waking moment. At first, they weren’t too bothered by it. Lovely? That means they’re friendly. Girl? That’s a ‘normal' word for a female, right? Being lovely is important as a woman. It’s expected. But, what if they want to be more than that? Inspired by true life events, Alleyne Dance create a dark, atmospheric and abstract work that is as thrilling as it is powerful. See workshop information on page 19. Lovely Girls follows Cristina and Chess’ poignant, hilarious and truthful journey as they explore what it is to be young women today, challenging the confusing, and often ridiculous, contradictions, clichés and expectations. Using their powerful blend of comedy, energetic dance and theatre, they imagine a world where women can be and do whatever they want. PULSE DANCE DAY Each year the New Wolsey Theatre invites DanceEast to programme an evening of new dance as part of its annual PULSE festival. ROCKBOTTOM is a challenging place. It’s an opportunity. ROCKBOTTOM is a deeply personal piece, about how Stuart hit his own “RockBottom” and survived to tell the tale. Combining compelling story-telling with highly physical choreography and humour ROCKBOTTOM skyrockets between highs, lows, ecstasy and despair with heart-warming honesty. This performance is suitable for ages 16+ years CONTEMPORARY DANCE THEATRE Supported by Arts Council England and DanceEast. Trigger Warning: This piece contains adult themes including sexual references, drug use and explores mental health issues. Stuart Waters is a local dance artist who has spent time in the Jerwood DanceHouse during the creation of ROCKBOTTOM. We've had the privilege of watching this compelling work evolve and we look forward to sharing it with you through PULSE Festival 2019. ELEPHANT IN THE ROOM Friday 21 June Lanre Malaolu 7.00pm Mohamed Toukabri 8.30pm Come along to just one performance or for the whole evening! This is the second Double Bill of the season, our first can be found on pages 3 & 4. This evening consists of male solos - both new to DanceEast. Lanre Malaolu first came onto our radar last year and we were blown away by the quality of his work, his brilliance and his energy. Mohamed Toukabri is a Brussels based artist. We first saw The Upside Down Man (The Son of the Road) at a festival in Dusseldorf. We were desperate to bring Mohamed to the UK, so joined forces with Shubbak Festival to secure a small UK tour. After DanceEast the work will be travelling to Pavillion Dance in Bournemouth, The Lowry in Manchester and London’s Southbank Centre. We hope you’ll be as excited as we are about these brilliant new artists and would love to hear your thoughts about our new Double Bill format. Arts Council England, British Council, Bagri Foundation and A.M. Qattan Foundation. From £12, £9 concessions choreographed by Avalon Rathgeb and TAP OSCiLLATE is supported by South London Dance Studios, Arts Council England and DanceEast. Dre Torres, that explores human interaction and the effects of miscommunication in relationships. Using movement, sound and light, the performers will take you through a journey of misunderstanding, confusion, fear and misconceptions - to compassion, acceptance, resolution and equality. The performance includes original analogue electronic music, composed specifically for this show out of electricity and its currents. Every sound you'll hear was manipulated from electrical currents to create tone, depth and a beautiful composition. Old Kent Road has spent a lot of time with us at DanceEast recently, working on OSCiLLATE and hosting a Tap Jam with our regular class attendees. We were very lucky to see this work in it's early stages of development and we can’t wait to see how it has transformed over the past year. You will leave the theatre feeling energised and if you’re inspired to give tap a go yourself, see pages 23-24 for our class timetable! See workshop information on page 20. From ÂŁ10, ÂŁ7 concessions inspired by the story of how the Jerwood DanceHouse has been and COMMUNITY DANCE. will be a home to so many. The event will feature a documentary style performance - including live dance performance, film and interview, that brings together the past, present and future artists of the Jerwood DanceHouse. It will have a story that captures the day-to-day life of the building, in an event that celebrates everything housed in the building now and in the future. UNIT artist, Tom Hobden, will be leading an open community group made up of DanceEast Performance Company members of the past 10 years - as well as potential future members. The performance will also feature Primary Steps - a Royal Ballet School programme which introduces primary school children to classical ballet. DANCEEAST CENTRE FOR ADVANCED TRAINING Students from the DanceEast Centre for Advanced Training (CAT) perform a mixed bill of original works commissioned by some of the most influential national and international choreographers - including James Wilton, Jess and Morgs, Joseph Toonga, Protein Dance, Sarah Blanc and Uchenna Dance. They will also perform a restaging of Umanoove/Didy Veldman’s The Knot that premiered here at DanceEast in 2018. Resident at the Jerwood DanceHouse, the DanceEast CAT is one of nine National Centres for Advanced Training in dance - offering part-time, nonresidential dance training to children and young people aged between 10 and 18 years, with exceptional potential in dance in the East of England. Entry into the the DanceEast CAT is by auditions, which take place in May and June each year. If this is something you would like to be part of, find out more online or pick up a prospectus from the Box Office. LOWESTOFT SOUTH BEACH Starts Saturday 22 June at 12.00pm, running for 24 hours and ends on Sunday 23 June. First Light Festival is a brand new, 24-hour, multi-arts festival in the beautiful beach-side setting of Lowestoft. The festival will begin at noon on Saturday 22nd June and will run continuously through changing tides, light and darkness, sun and stars, until noon on Sunday 23rd June. First Light Festival creates a truly unique shared experience of music, dance, film, art, science, talks, walks, fire, kids activities, sports, well-being and workshops. VOICE AND MOVEMENT WORKSHOP WITH LANRE MALAOLU This workshop will explore ways of fusing movement and words to create an organic and layered performance. Using distinct exercises and with insights into Lanre's unique making process, the workshop will take an in-depth look at how words and text can be found in the same place we move from as dancers. Suitable for adults over the age of 16 years. Price: £12 See performance information on page 7. See performance information on page 9. These classes are for those with additional needs; ages are for guidance, please call the Box Office to discuss your requirements. Dance for Parkinson’s classes run from Wednesday 1 May – Wednesday 3 July. Please note: classes are subject to change. Classes are for everyone over 16 years of age unless a specific age is given in brackets. Open classes are suitable for all levels of experience and abilities 1 for people with little experience 2 for people with some experience. PLEASE SEE PAGE 27 FOR HOW TO BOOK CLASSES, PRICES AND OFFERS. •	Studio Theatre •	World-class dance studios •	Therapy Room •	Café •	Foyer and Bar •	Whistler Gallery •	Meetings Rooms These spaces are not only suitable for artistic purposes like rehearsals and performances, but are great for corporate events, AGMs, staff briefings, meetings or away days. Over 150 performers from the CTC Academy will take to the stage this June as they proudly present their 10-year showcase; a celebration of local young talent and musical theatre. Featuring The Greatest Showman, Mamma Mia, Disney and much more, this show is the perfect musical treat for all ages! Saturday 20 July | 2.30pm & 7.00pm THIS IS IT ... the show that will have you all dancing in your seats. From big screen hits such as Bohemian Rhapsody and The Greatest Showman to Box Office hits such as The Lion King, Aladdin and Motown the Musical, this show really does have something for everyone. Individual show ticket prices can be found on each show page. Book early to get the seats you want at the best deal, as prices will change as the demand for tickets increases. School offers are available for all shows. £6 Student tickets, plus 1 teacher free with every 10 booked. For bookings of 10+ save 10% – please call our friendly Box Office team on 01473 295230. If you are aged under 26, over 60, registered disabled or on income support, tickets cost from £7, please see individual show pages. If you do not need a concessionary rate ticket please tell us at the time of booking and we can ‘donate the difference’. As a registered charity every little donation makes a big difference to us. FAMILY TICKETS Family tickets are sometimes available for our performances for groups of 2 adults and 2 children or 1 adult and 3 children. CLASSES AND COURSES All of our classes are bookable via the website or alternatively through our friendly Box Office team. PAY AS YOU DANCE Only available for classes marked on pages 23 and 24. Adults £7, Concessions £6, Under 16s £5.50. ACCESS To ensure that your visit is as smooth as possible, please contact us in advance to advise of any access needs or to reserve a wheelchair space. *Opening hours will be revised for performances and events. Please call to check opening hours before making a special journey. All discounts are subject to availability, only one discount applies and cannot be used in conjunction with any other offer or concession. Concessions for classes and courses are classified as over 60, student, registered disabled and income support. Classes for Tots & Co (1 adult and 1 Tot) are the same prices as concessions listed above. Additional places for Tots can be purchased at £4 per Tot. Once purchased, performance, classes and workshop tickets cannot be exchanged or refunded. The information in this booklet was correct at the time of going to print. 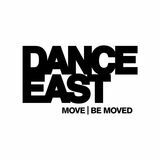 DanceEast reserves the right to amend prices, discounts and benefits at any time. Fees and transaction charges are subject to change. 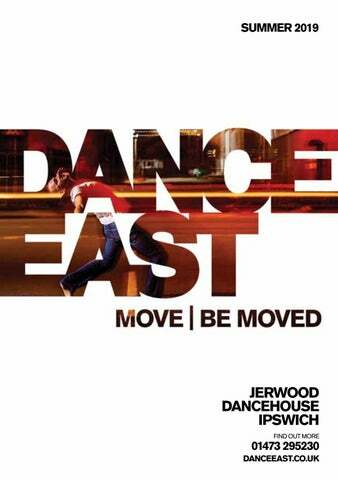 PLANNING YOUR VISIT THE JERWOOD DANCEHOUSE IS SITUATED AT THE MILL ON IPSWICH WATERFRONT. IT IS APPROXIMATELY A 15 MINUTE WALK FROM IPSWICH TRAIN STATION AND THE TOWN CENTRE. We are committed to providing creative opportunities for artists and great dance for everyone. Join us as a friend, best friend or patron and together we will make the East of England a place where everyone can engage with great dance. You will receive priority booking and regular newsletters, but most importantly your annual commitment will provide extraordinary performances, life-affirming participatory opportunities for all and a world class environment for artists at all stages of their careers. DOUBLE THE DONATION DOUBLE THE IMPACT All donations will be doubled thanks to Arts Council England’s Catalyst: Evolve, enabling many more people to get involved. "A CHANCE TO MEET PEOPLE MY AGE TO "SOCIALISE" AND HAVE A LAUGH. LIMBER UP MY STIFFNESS, USE MY BRAIN TO REMEMBER EXERCISES AND DANCE MOVES!" It’s easy; complete the attached form, go online, call us or visit us in person. Friend £50 Best Friend £125 Patron £550 This sum includes a charge for the beneﬁts provided on which we pay VAT. Please see website for further details. Boost your donation by 25p of Gift Aid for every £1 you donate. Gift Aid is reclaimed by the charity from the tax you pay for the current tax year. Your address is needed to identify you as a current UK taxpayer. In order to Gift Aid your donation you must tick the box below: I want to Gift Aid my donation, and any donations I make in the future or have made in the past four years to DanceEast (Charity Number 01066825). I am a UK taxpayer and understand that if I pay less Income Tax or Capital Gains Tax than the amount of Gift Aid claimed on all my donations in that tax year, it is my responsibility to pay any diﬀerence. If you pay Income Tax at the higher or additional rate and want to receive the additional tax relief due to you, you must include all your Gift Aid donations on your SelfAssessment tax return or ask HM Revenue and Customs to adjust your tax code. •	Want to cancel this declaration •	Change your name or home address •	No longer pay suﬃcient tax on your income or capital gains.